Some Russian defense news from Monday, April 16, 2012 . . .
Mil.ru covered the start of Far East LRA command-staff training (KShT). Crews from Belaya, Tiksi, Seryshevo, and Kamennyy Ruchey will fly on the Litovka range in Primorskiy Kray. 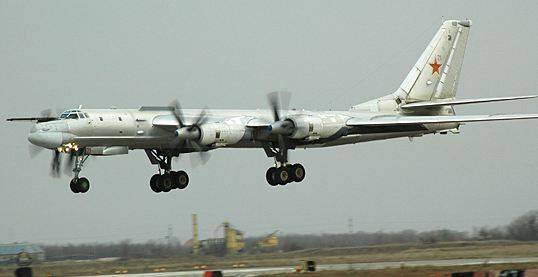 Tu-95MS, Tu-22M3, and Il-78 aircraft will rebase, patrol, and conduct aerial refuelings and cruise missile launches until April 20. Krasnaya zvezda described a recent Western MD comex. Signals Troops built an autonomous multilevel network of nodes connecting open and secure comms for Ground Troops’ brigades and regiments, Baltic and Northern Fleets, and Air Forces and Air Defense throughout the region. The defense daily said these forces were connected in a single, online information space. Training ended with a videoconference. About 7,000 troops and 1,500 pieces of equipment participated. Mil.ru noted the arrival of 152mm Msta-S SP howitzers in the Southern MD. They are replacing 20 2S3 Akatsiya howitzers. There’s a lot of media attention to the renewal of arms and equipment in Russia’s South. You can find one comprehensive review here. RIA Novosti picked up Aviastar-SP’s announcement that it’s renovating six An-124 / Ruslan transports for the Air Forces by 2014. This modernization will give them newer engines and bring the aircraft to the An-124-100 level.